Founded by DavidPaul Doyle and Candace Doyle, The Voice for Love is a personal, practical, experiential approach to spirituality based upon the teachings of the Holy Spirit. The Voice for Love honors the universal truths within all religions and recognizes the divinity of each individual’s spiritual path. God is Love, the Source and Essence of All That Is. God is infinite, eternal, and ever present. God is divine energy, continually extending, creating, expressing, and sustaining all creation. The Voice for Love uses other words to describe God as well, such as Spirit, Being, the Great I Am, the Essence of Life, Source, Creator, Cosmic Consciousness, Universal Mind, and Unconditional Love. The Holy Spirit is the bridge to the Mind of God existing within each individual. The Holy Spirit is the part of our Divine Self that offers right perception, the opportunity to perceive the world through the eyes of God. The purpose of the Holy Spirit is to restore each of God's children to the awareness of its wholeness and oneness with God. The Holy Spirit acts as the Voice for God and serves as the eternal reminder of the Truth of Who and What We are. This Voice for Love within each of God's children goes by many names, including Right-Mind, Inner Guide, Inner Teacher, Comforter, Advocate, still small Voice within, Higher Self, and God’s Voice. We believe that through his practice, dedication, and desire to think only Truth, speak only Truth, and hear only Truth, Jesus demonstrated to humankind that it is possible to hear and speak only the words of the Holy Spirit during our time on earth. We see Jesus as an expression of the Holy Spirit and a divine teacher of Truth. The Voice for Love uses the term Christ to mean the Divine Consciousnes with humankind. Jesus is a great example of Christ Consciousness in expression. Because this Divine Consciousness is within and part of each of us, we all have the potential to deepen our awareness and expression of this Divine Consciousness in the world. Because God is Love and we are One with God, our divine nature is Love as well. Our purpose as individual, eternal expressions of God is to restore our awareness, through the Holy Spirit, to our divine nature, as Jesus demonstrated. The more we awaken to the awareness of our divine nature, the more peace, love, joy, and wholeness we experience and share in the world. The Voice for Love teaches a 5-Step process for embodying our Divine Consciousness in the world. We believe that everyone has the ability to access and share this Divine Consciousness in their lives. By learning how join with this part of your Self, you become fully capable of expressing the loving guidance, wisdom, and Truth within you at all times. The Voice for Love 5-Step Process is a means to experiencing your Oneness with God. In the Voice for Love, we feel a sacred responsibility, individually and collectively, to make a positive difference through personal example and active service in our churches, our families, our communities, and our world. The Voice for Love is an IRS tax-exempt 501(c)(3) Public Charity with a Board of Directors. All donations made to The Voice for Love are tax exempt. To support The Voice for Love and its mission, click here to make a donation now. 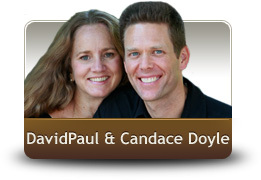 DavidPaul Doyle and Candace Doyle are the founder of The Voice for Love, a leading nonprofit, nondenominational spiritual organization and global community of people who join together in celebration to give and receive love, communication, inspiration, learning, and support for being the Presence of Love in the world. The Voice for Love's worldwide team of certified spiritual counselors, coaches, and teachers provides education and training through its free telephone hotline and resource center, through its website, and through its many public events throughout the world, including workshops, weekend intensives, tele-seminars, and certification programs. "Thank You! I am really overwhelmed by your 30-Day Course on how to hear the Voice of God! THIS is what I have been waiting for, and I'm only on Lesson 11! I now have the Inner Peace I've been seeking for the past 51 years!" "I personally found your instructions on how to quiet the mind chatter and get in touch with the Voice of the Spirit to be the most helpful and transformative I've ever been given." "The Doyle's 30-Day Course on hearing God's Voice will change your life. The act of DOING these exercises, rather than listening to them, really brings the experience home. The Presence of God is now with me at all times, and I can call on this Voice throughout my day!"